At Rheinmetall, business partner verification or third party assessment means a series of background analyses of a potential business partner prior to the conclusion of the contract. The focus is on excluding possible compliance risks. These may include indications of criminal conduct on the part of the business partner, opaque ownership structures with the risk of tax evasion or money laundering, or conflicts of interest with competitors or with Rheinmetall itself. Although the defense and automotive sectors have different risk emphases, the importance of early detection of possible critical scenarios is always paramount. At Rheinmetall, business partner reviews are conducted on the basis of a division of labor procedure. A specialist team at Rheinmetall headquarters carries out standardized background checks on business partners and then transfers these results to the compliance area organization via special IT interfaces. There, business-case and contract-specific reviews are carried out by the operational compliance officers. To protect the company's reputation and to ensure a cooperation built on the basis of trustt Rheinmetall also expects its suppliers, service partners and customers to follow the same behaviour and share the same basic attitude. This shared understanding was therefore condensed into our Supplier Code of Conduct which must be signed by all of our suppliers and service providers on a mandatory basis. Integrity" is therefore an essential selection criterion for cooperation with business partners along the entire value chain. The Rheinmetall Group pursues a structured process for the qualification of new suppliers. 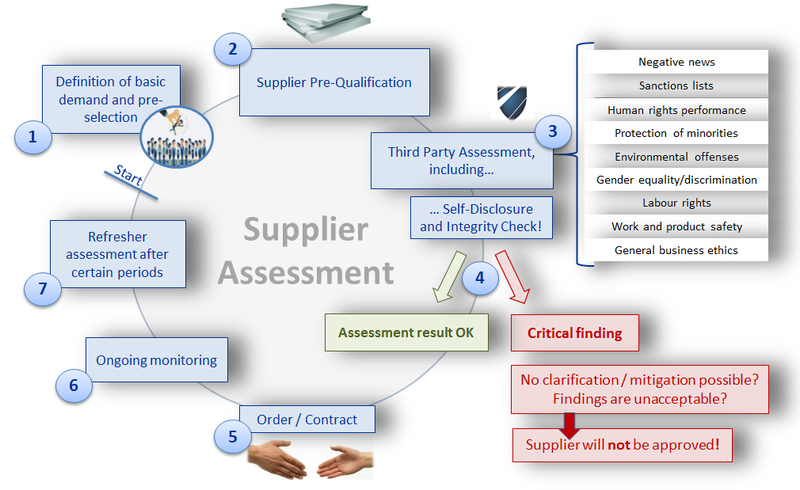 The process begins with the supplier's self-assessment of various commercial, technical and other parameters. On the basis of this data, we evaluate the general suitability of the supplier. This initial assessment is later supplemented by supplier audits. For selected suppliers - based on the criteria of business country, sales and other risk criteria - we additionally apply a variety of more comprehensive evaluation procedures. These assessments not only include a thorough validation of the supplier's policies, processes and general commitment to ensuring compliance. We also conduct thorough background checks of the supplier's actual performance in terms of human rights, labor rights, occupational safety, gender equality, anti-discrimination and environmental protection. In the event of relevant evaluation results, Rheinmetall will work with the supplier to clarify any potential problems identified. The final recommendation as to whether the transaction should be pursued further or not is made by the Compliance Assessment & Monitoring department. During the series delivery phase, Purchasing regularly checks the supplier's quality and ability to deliver. These performance indicators are the most important input for our series supplier evaluation, which is regularly updated and shared with the suppliers. We strive for a continuous improvement of supplier performance through our supplier evaluation. At the same time, selected suppliers are continuously monitored for > 1,000 sanctions, criminal records and databases for adverse media - including human rights-oriented sources of information. Acquisitions, strategic alliances and joint ventures are a central element of Rheinmetall’s ongoing internationalization and growth strategy, in order to improve its market positions, supplement existing business or penetrate new segments. For this, Rheinmetall defines recommended actions based on continuous analyses of the market environment and its own portfolio. In accordance with group-wide guidelines, potential target companies are subjected to a careful analysis of opportunities and risks through standardized processes such as extensive due diligence procedures and are assessed on the basis of strategic, commercial, operational and financial aspects. Following an approval process carried out over several distinct stage gates, the Executive Board and, where the transaction volume exceeds defined value thresholds, the Supervisory Board of Rheinmetall AG decide on the acquisition project. As a Group for leading technologies in mobility and security, we always present ourselves to our customers transparently, impartially, and with the requisite professional distance, regardless of whether customers are from the public or private sector or how far back the business history extends. We only use critically preselected consultants or lobbyists at the interface to politics and authorities. They are subject to the same high compliance standards as Rheinmetall employees themselves. Rheinmetall Defence has representative offices in Berlin and Brussels. Rheinmetall does not send or employ any staff in ministries. Contributions to democratic political parties are subject to applicable laws and internal, often stricter compliance regulations. They fall within the remit of Rheinmetall AG's Executive Board, which restrictively handles approvals.